A classic style dog collar that makes a bold fashion statement. 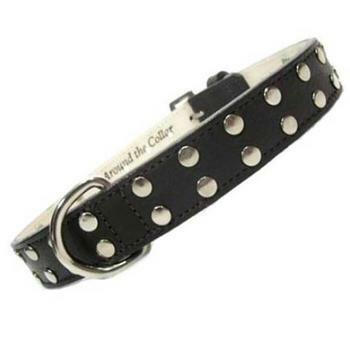 Adorned with a double row of nickel studs and this collar has a stitched and painted edge. There is an O-Ring on the leather loop to attach an ID tag. Finely crafted yet extremely durable so that it will last for many years. Match it with a leash and poop bag holder to complete the look. To measure your dog's neck, take a piece of string and wrap it around your pet's neck where a collar should go. Mark the string, then lay it flat and measure it. That is the circumference of your dog's neck. Of course, tape measures work too! Our collars are sized when closed to the center hole. Please measure carefully since all of our products are made to order and therefore cannot be returned.